Click on images or on the links below the images to enlarge them. 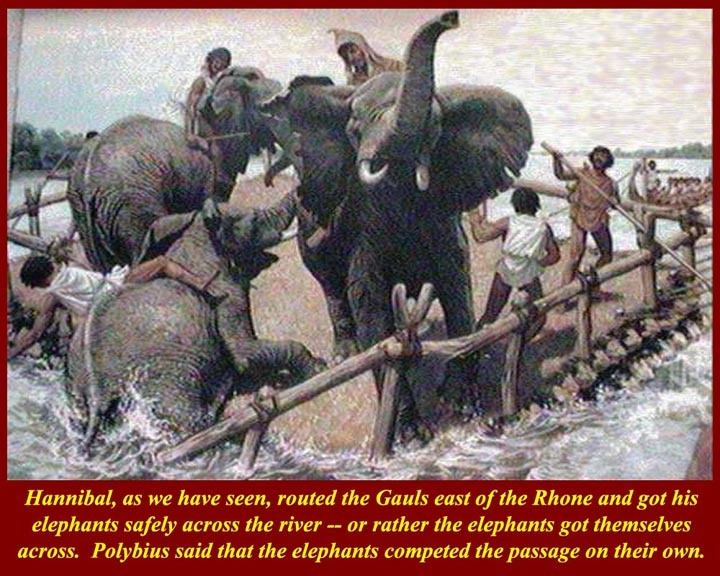 Hannibal, after defeating the Gauls on the east bank of the Rhone, ferried his baggage and elephants across the river. The elephants panicked and ended up swimming the second half of the crossing. 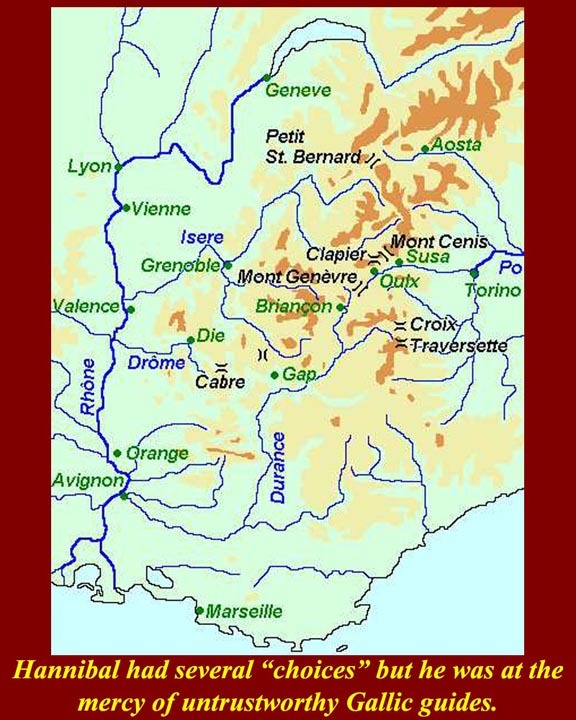 After crossing the Rhone, Hannibal continued north along the east bank and then turned eastward. 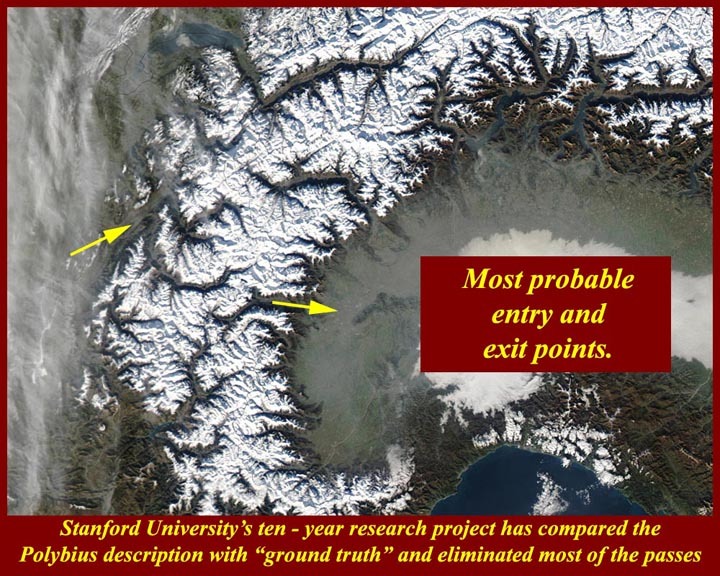 Most recent research (analysis of Polybius compared to "ground truth") indicates that he went up the Isere River valley into the Graian (Western) Alps. 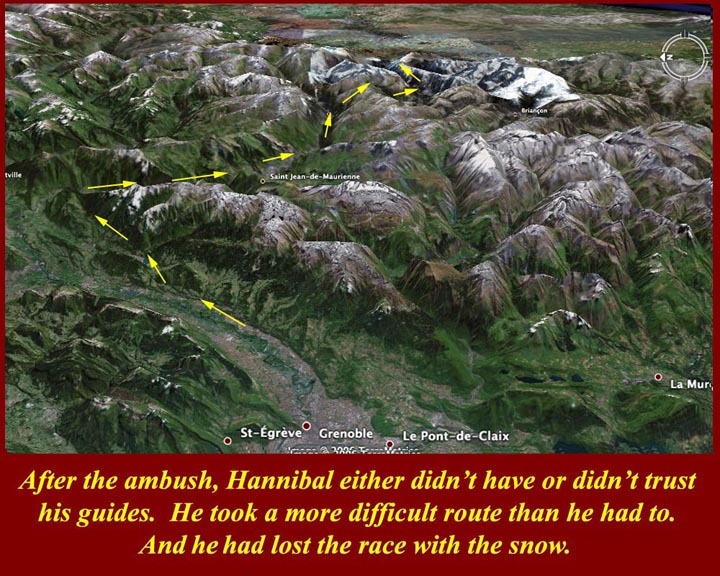 The image shows the part of the Alps he entered, but later in the year than when Hannibal started his trek. The image shows the current available routes through the alps (excluding some tunnels). 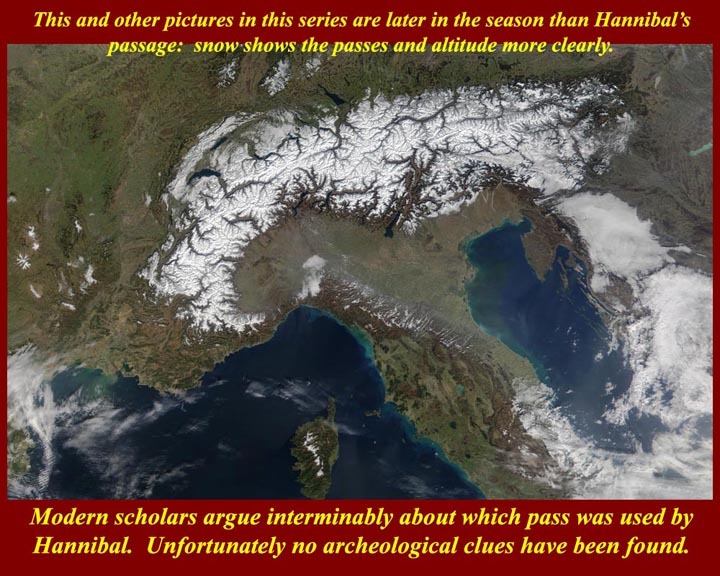 It was also made later in the year than Hannibal's passage, but the snow shows the passes more clearly. A map shows the passes of the Graian Alps. The coastal route would have been easiest, but that was forclosed by the presence of a Roman Consular army. 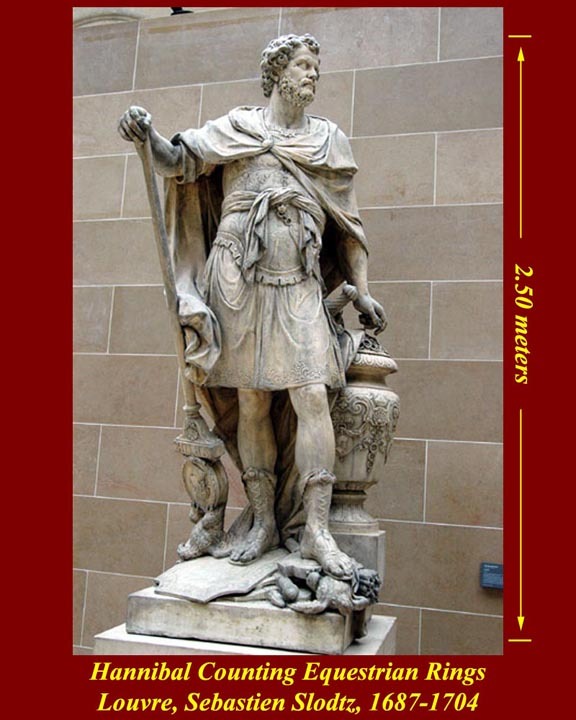 Hannibal used Gallic guides that didn't serve him well. They led him astray and also, ultimately, into an ambush. 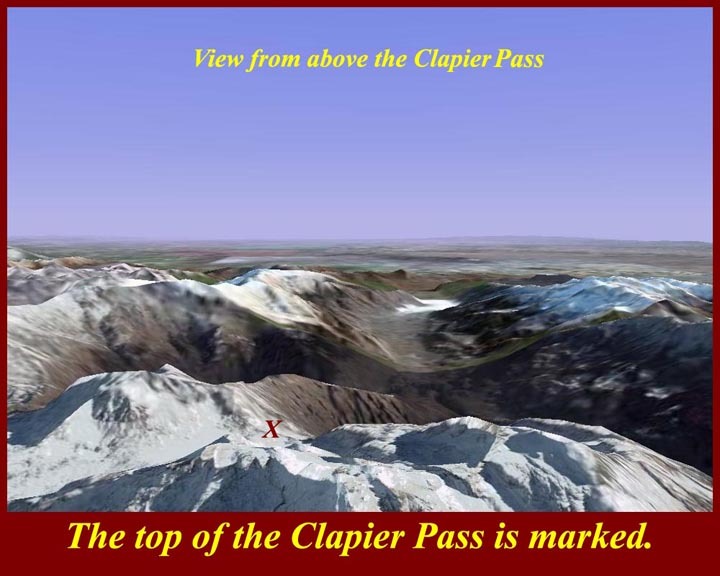 In the event, he probably followed the Isere River and the Clapier up to the Clapier Pass. 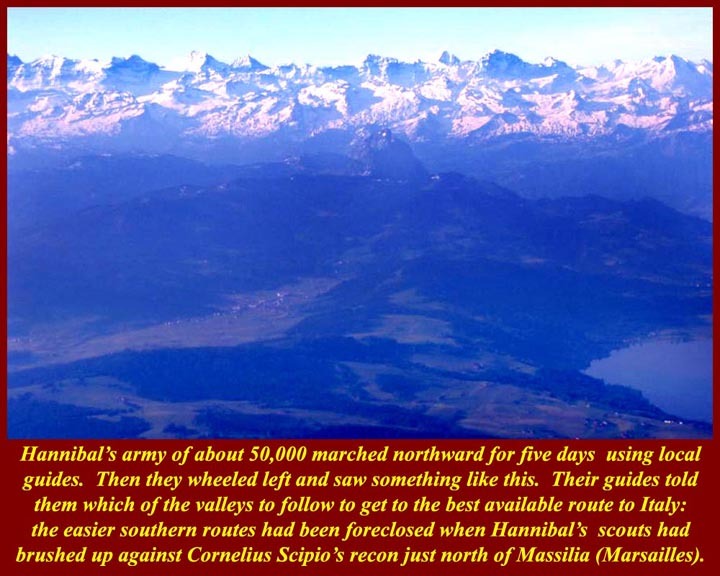 Polybius interviewed at least one literate survivor of Hannibal's march through the Alps, and described the route in detail. Modern historians wish that he had given the names of geographic features along the route, but there is no guarantee that we would be able to correlate the ancient Gallic names to modern names. 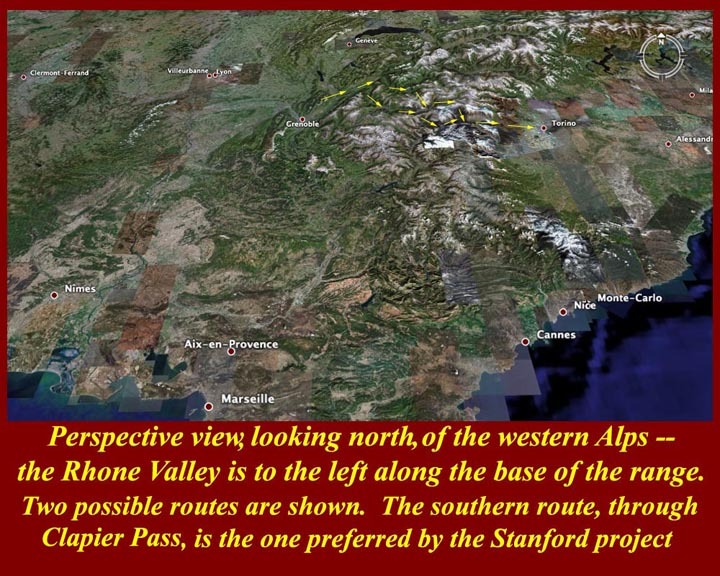 The most detailed research on the route Hannibal took has been done by Stanford University and involve hundreds of trips on foot through the various passes. A satellite photomontage of the Graian Alps (from the south) at about the time of year tha Hannibal went through the alps. It's probable that he went through in October, but it may have been as late as early November -- much later in the year than he would have wanted. Looking west, we can see the easier route that was available but which Hannibal did not take either because of the ineptitude or because of the treachery of his Gallic guides. From the top of the Clapier Pass you can look down onto the northern Italian plain. This, along with a narrow defile that matches the description by Polybius of the ambush site, is what distinguishes this route from other routes proposed over the years. 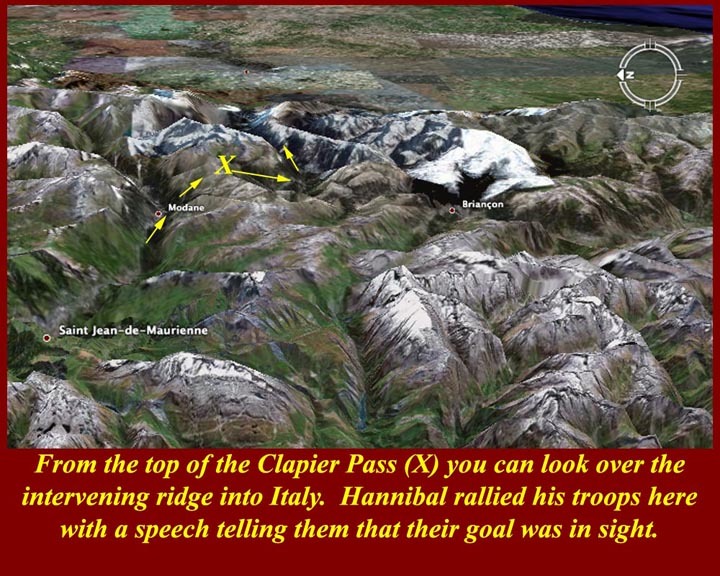 Hannibal, according to Polybius, stopped for a day at the top of the pass (and Clapier is the only pass that has room to bivouac an army) and then showed his troops their first view of Italy. The view into Italy from the Clapier Pass. The downward slope was slick and dangerous, and at a point just below the pass there had been a landslide that completely blocked the path. Hannibal's sappers had to dig through it all to keep the convoy moving. One huge rock had to be heated and then cracked by pouring "vinegar" (cheap sour wine) over it. They cleared a narrow path for the men and horses and then widened it for the elephants. Polybius's source told him new snow was falling at and beyond the pass and that it fell on top of snow left over from the previous year. Passage of thousands of men and animals turned it to slush over ice. 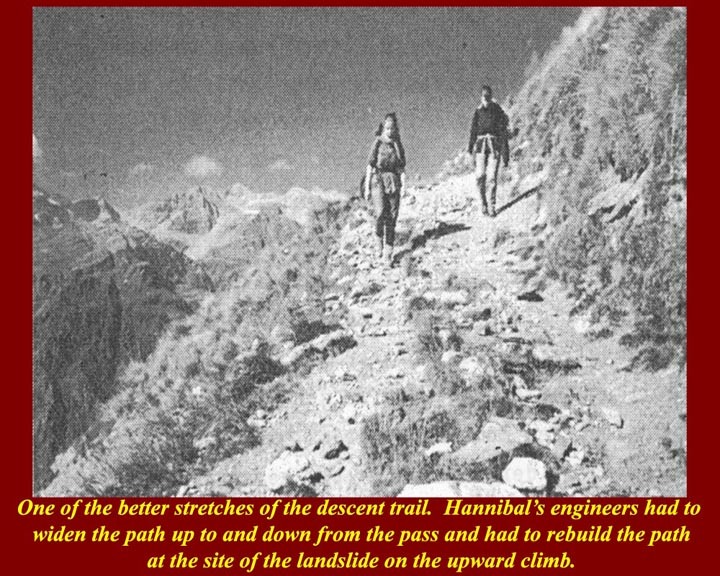 The downward path was much steeper than the path up to the Clapier Pass -- in some places the slope was 70%, i.e., there was a 7 meter drop for every 10 meters forward. Men and horses can pass down such a slope if it's dry, but snow was falling and there was old ice on the slope. Many fell to their death. 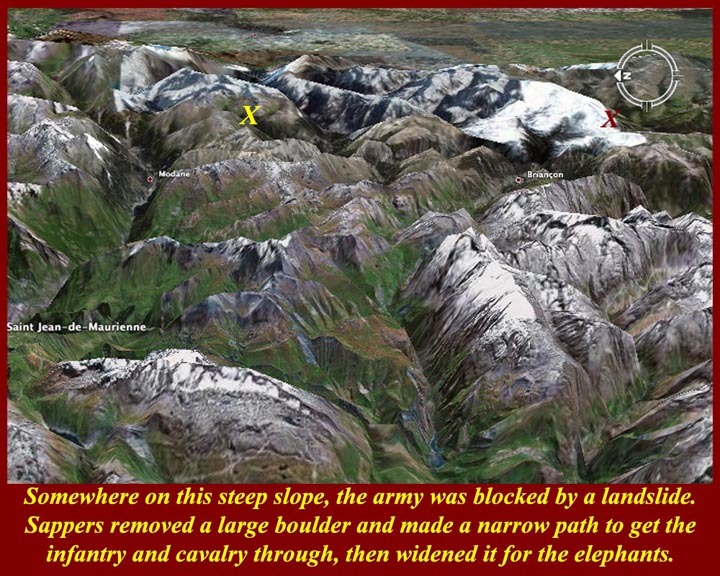 Elephants would find such a slope virtually impossible -- only seven survived the Alpine march. Even in summer the Italian side of the Clapier Pass is difficult. 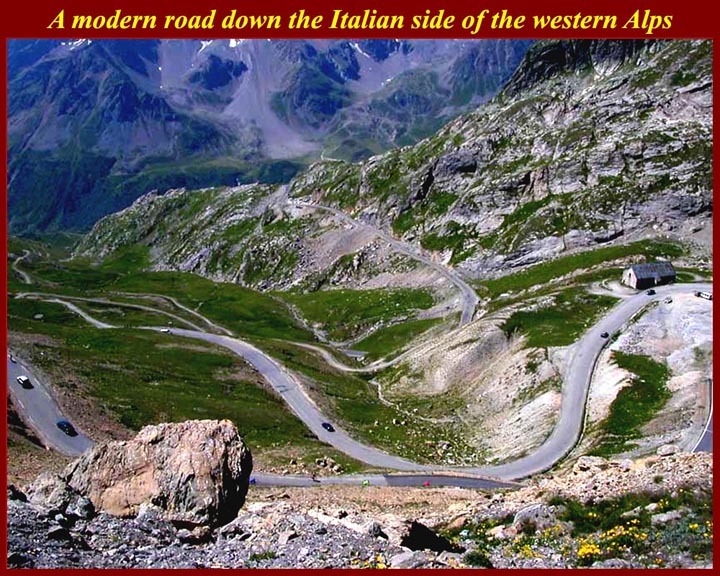 This switchback road gives you some idea of the slope on the Italian side of the Graian Alps. The Alps are one of the newest mountain ranges in the world, and therefore they are among the most rugged. 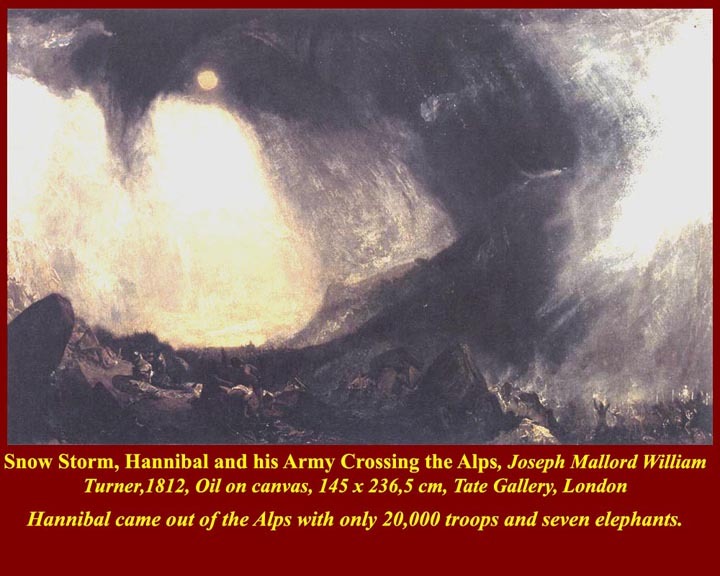 Joseph Mallord William Taylor's 1812 painting evokes the terror of Hannibal's passage through the Alps. He entered the Alps with an army of 50,000 men, and fifteen days later only 20,000 were left. They rushed out onto the plain to search for food for themselves and their mounts. 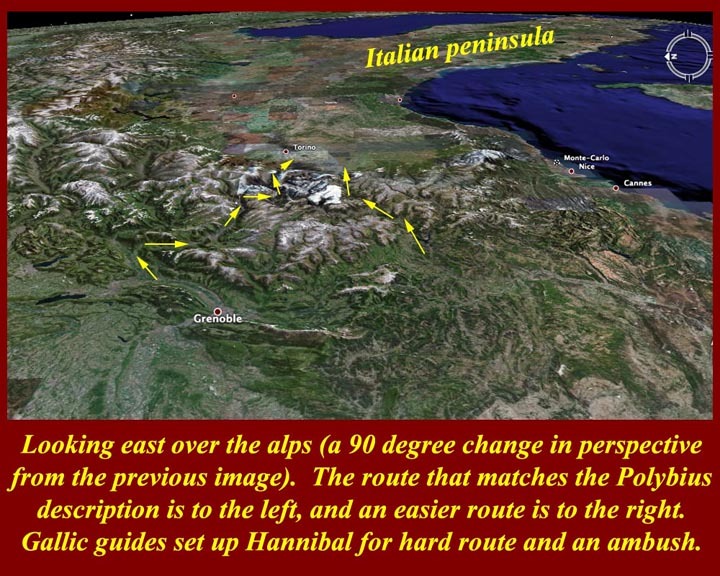 Scientists may be closer to revealing the route taken by Hannibal as he crossed the Alps to attack ancient Rome. A team says they have found a churned up layer of soil at an Alpine pass near the French-Italian border that dates to the time of Hannibal's invasion. In Archaeometry journal, they say the disturbed sediment was rich in microbes that are common in horse manure. 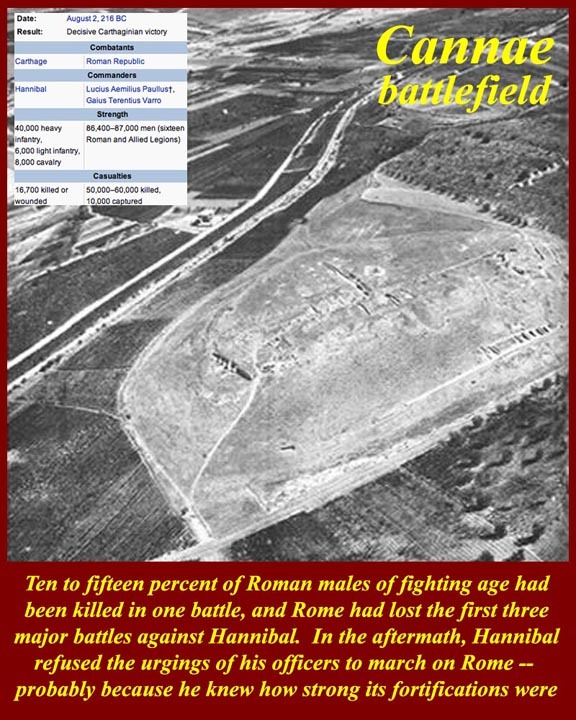 Hannibal's third century BC campaign is seen as one of the greatest military endeavours in antiquity. He was commander-in-chief of the Carthaginian army during its second war with Rome (218-201 BC). 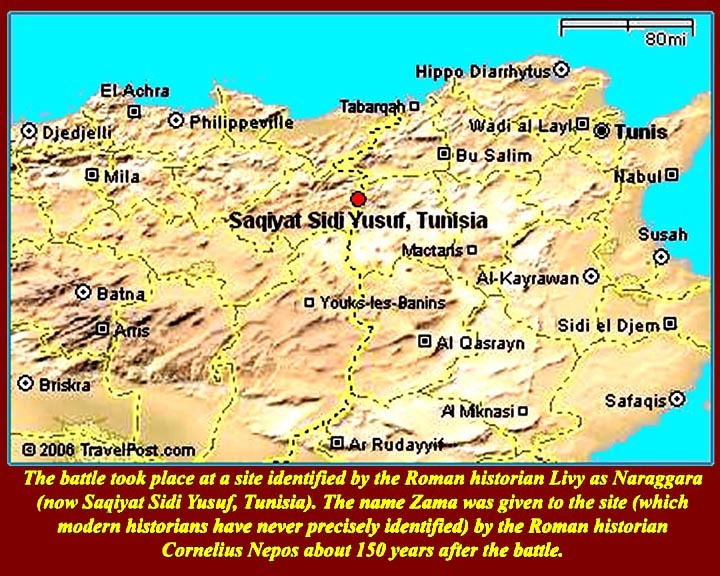 Carthage was located in present-day Tunisia and was Rome's main military rival at the time. 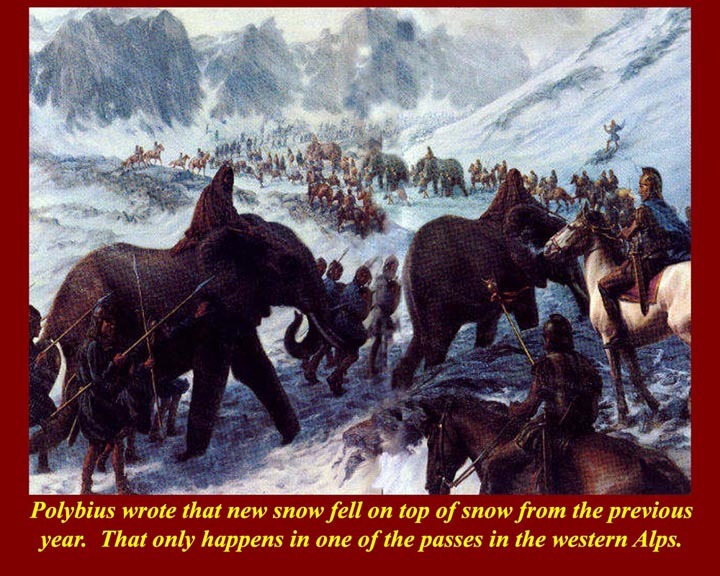 In an audacious manoeuvre, Hannibal led about 30,000 troops, 15,000 horses and 37 elephants across the Alps to challenge Roman power on home soil. It was very nearly a masterstroke: in a series of battles, the Carthaginians brought the Roman military to its knees. But Hannibal was ultimately defeated at the battle of Zama in 202 BC. 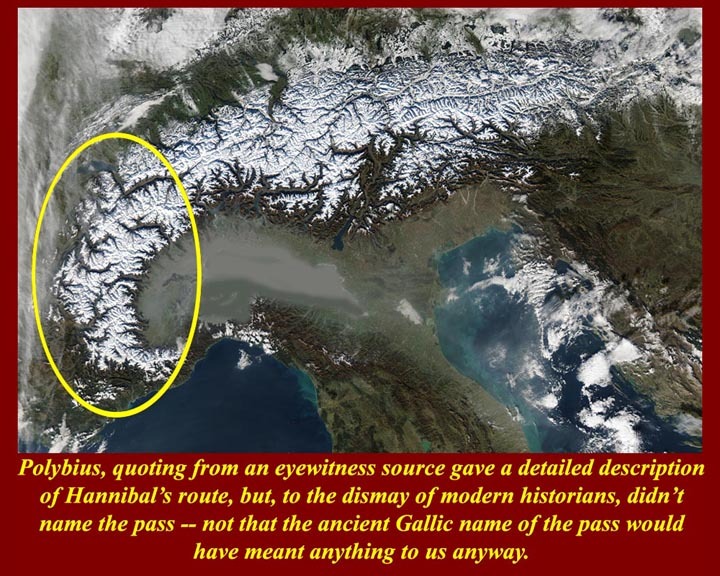 Historians, statesmen and academics have long argued about the route Hannibal took across the Alps. 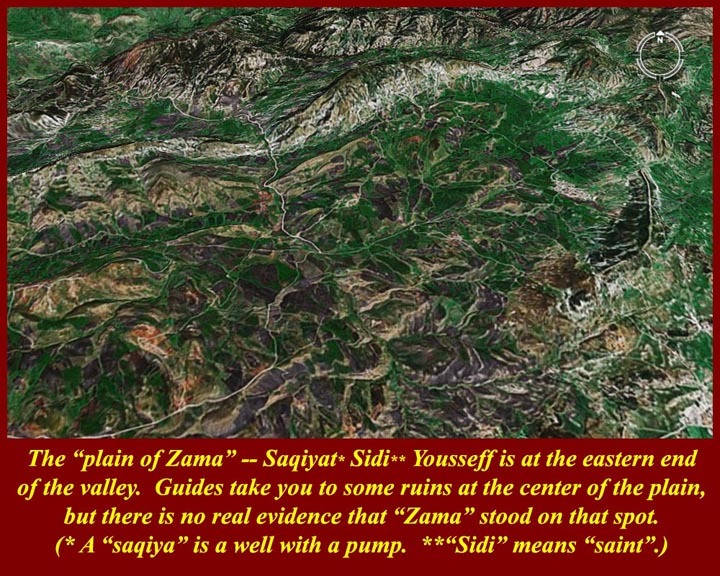 Firm archaeological evidence has been difficult to find. But an international team has now argued that the military commander led his troops across the Col de Traversette mountain pass at an altitude of 3,000m. The results may not yet be a smoking gun, but the researchers are hopeful of finding other evidence from the deposit, such as tapeworm eggs from horses - or even elephants. They found a churned-up mass of sediment in a 1m-thick mire at Col de Traversette that could be directly dated to the time of the invasion. Dr Chris Allen, from Queen's University Belfast, said the layer had been produced by "the constant movement of thousands of animals and humans". "Over 70% of the microbes in horse manure are from a group known as the Clostridia, that are very stable in soil - surviving for thousands of years," he said. "We found scientifically significant evidence of these same bugs in a genetic microbial signature precisely dating to the time of the Punic invasion." 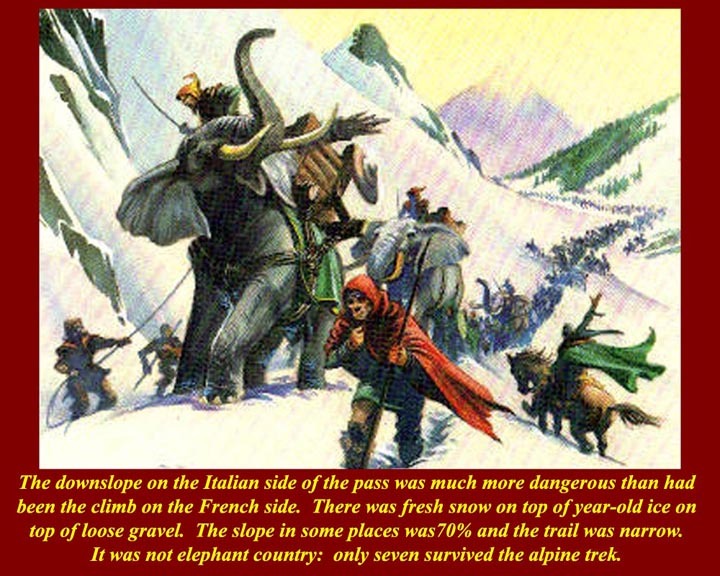 People had been going through the Alpine passes for centuries, but nobody had tried to squeeze through with a large army. Even after all the losses, Hannibal came down into the Italian plain with 20,000 men, many horses and seven elephants. There he met with the Taurini Gauls who overcame their initial misgivings and allied themselves with Hannibal. 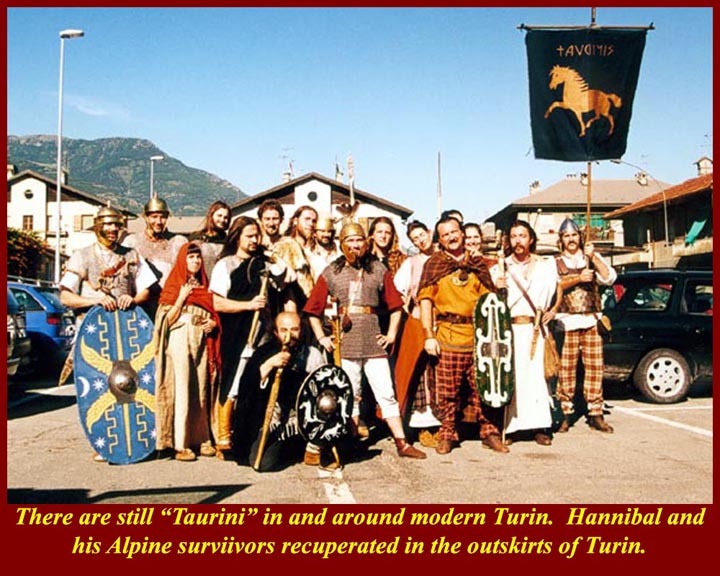 The Taurini and other Cis-Alpine Gauls had been fighting Rome for years, trying to prevent Rome from colonizing their region. There are still Taurini in and around Turin -- or at least Taurini pretenders. The modern Taurini are often associated with northern seperatists. Publius Cornelius Scipio left his army at Massilia and rushed back to northern Italy top raise a new army to intercept Hannibal. Their first contact was in Novenber of 218 BC, just weeks after Hannibal's arrival, along the banks of the Ticinus River, a tributary of the Po. 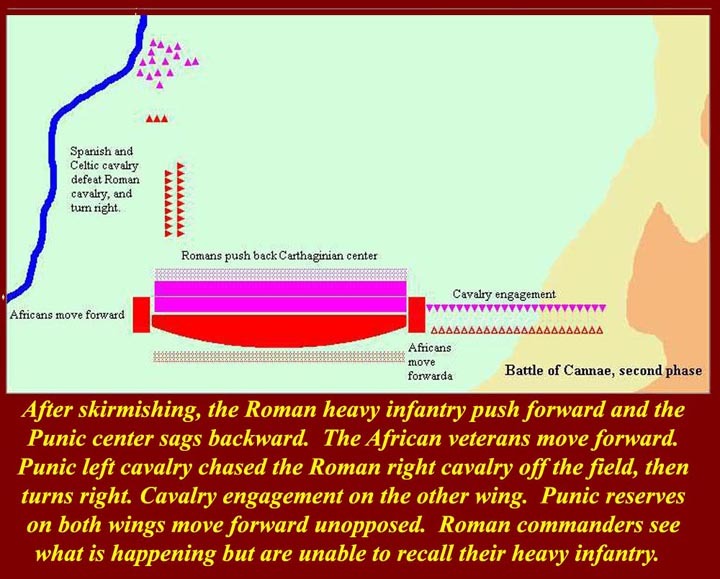 Scipio had marched out with light infantry and cavalry and was met by a larger force of Carthaginian cavalry. The Romans lost badly and Scipio was wounded -- saved from death or capture, according to legend, by his young warrior son who later was to become Scipio Africanus the Elder. 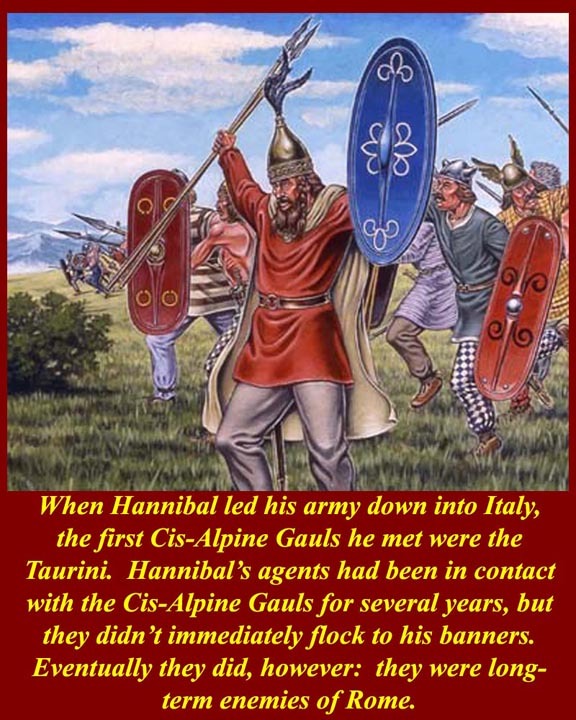 This early small victory brought many formerly hesitant Gauls to Hannibal's banner. 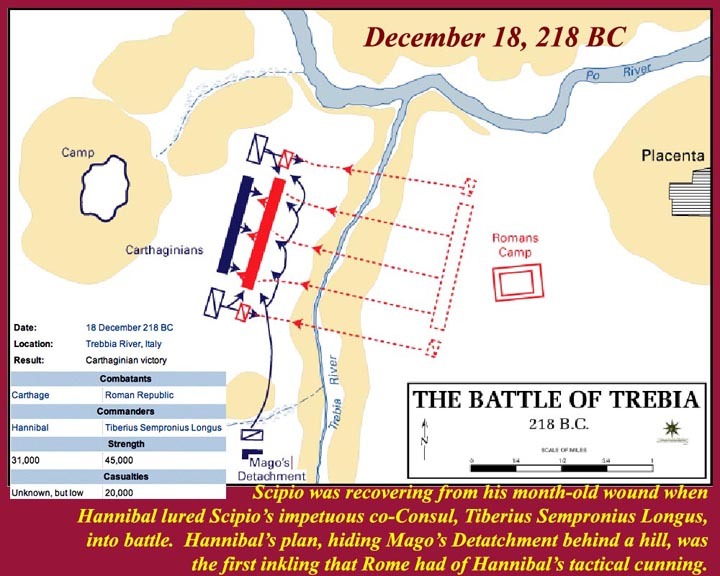 Before another month had passed, and while Scipio was still recovering from his wound, Hannibal lured Scipio's impetuous co-Consul, Tiberius Sempronius Longus, into battle. 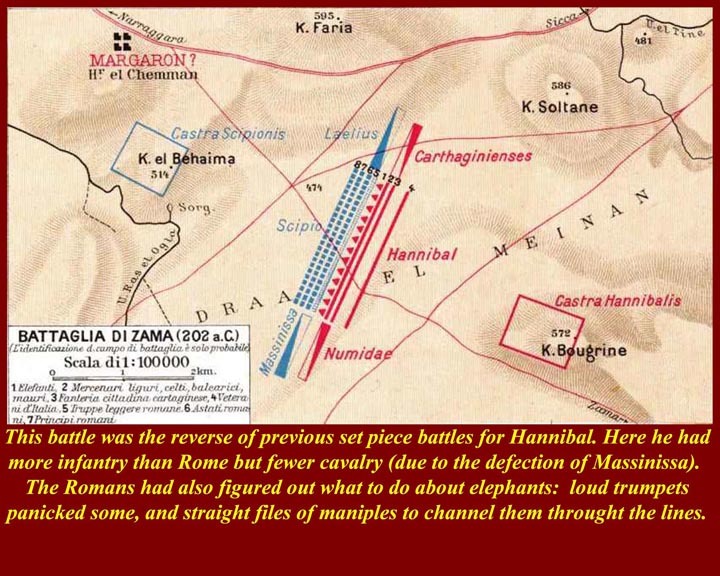 Hannibal had hidden a strong detachment of cavalry behind a hill south of the battlefield, and that was decisive. Shortly after the battle, another Roman cavalry unit was chopped up in the area by a Carthaginian (Numidian) cavalry unit. 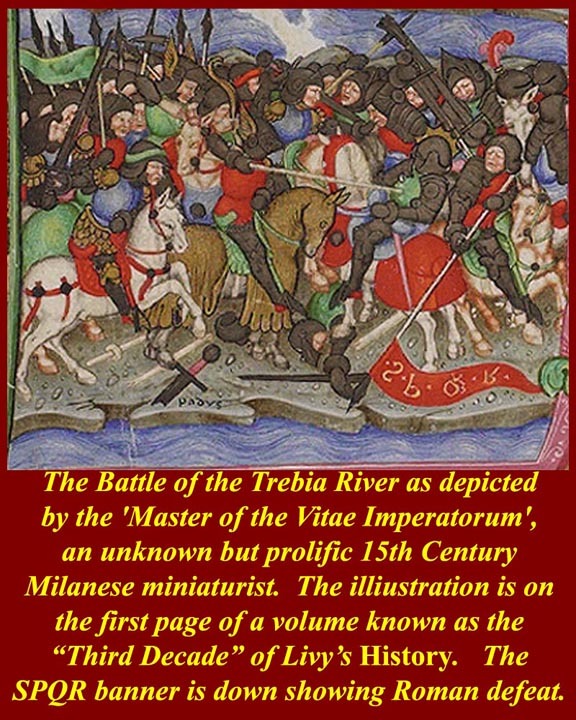 A 15th century miniature showing the first Roman defeat. After the Trebia River battle, there were small and cautious engagements in Italy. 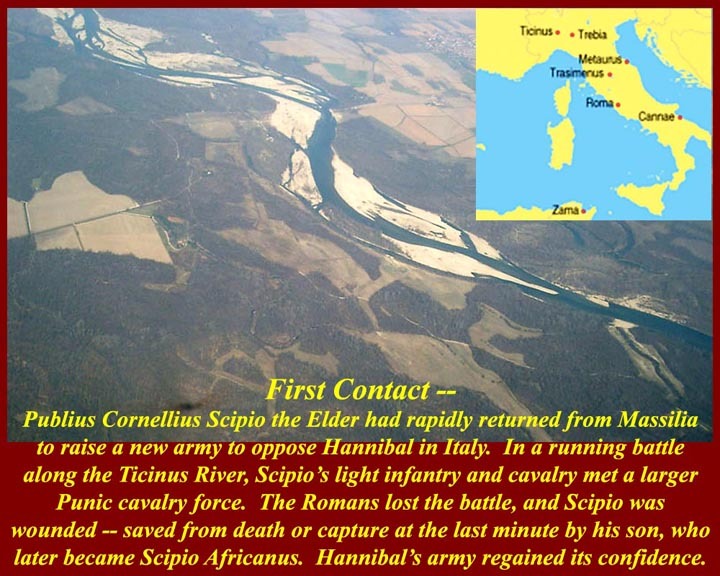 In Spain, Scipio's brother, Gnaeus Cornelius Scipio, who had been left in command of the army that Scipio had left at Massilia, defeated the 10,000 man force that Hannibal had left south of the Pyrenees. Spain north of the Ebro river was now under Roman control. 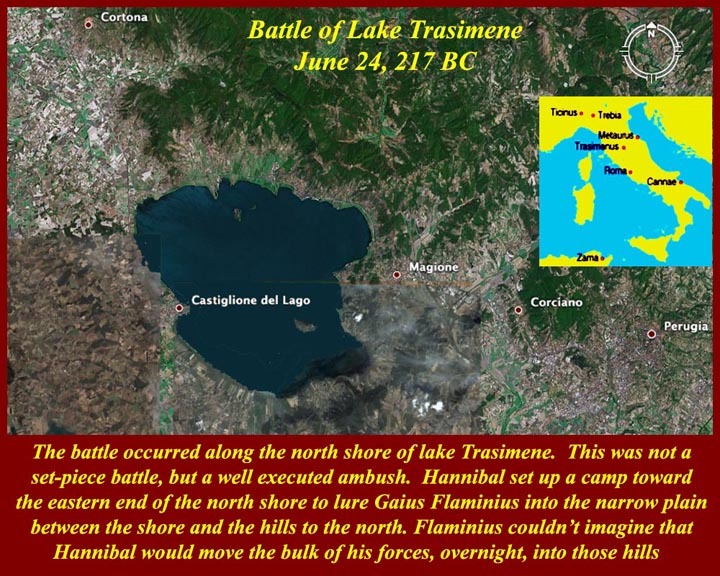 The ambush and defeat of the Roman army under Gaius Flaminius on the northern shore of Lake Trasimene in June of 217 BC was another serious blow to Roman morale. 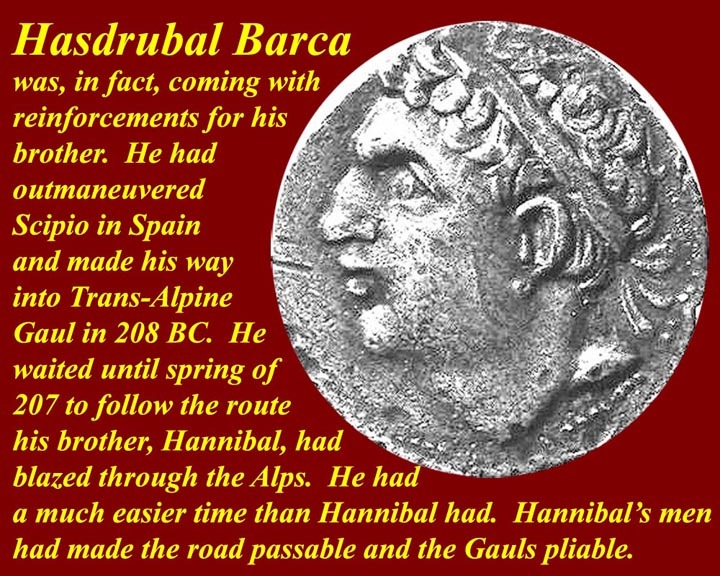 Flaminius had been pursuing Hannibal around the north since the beginning of the 217 campaign season. 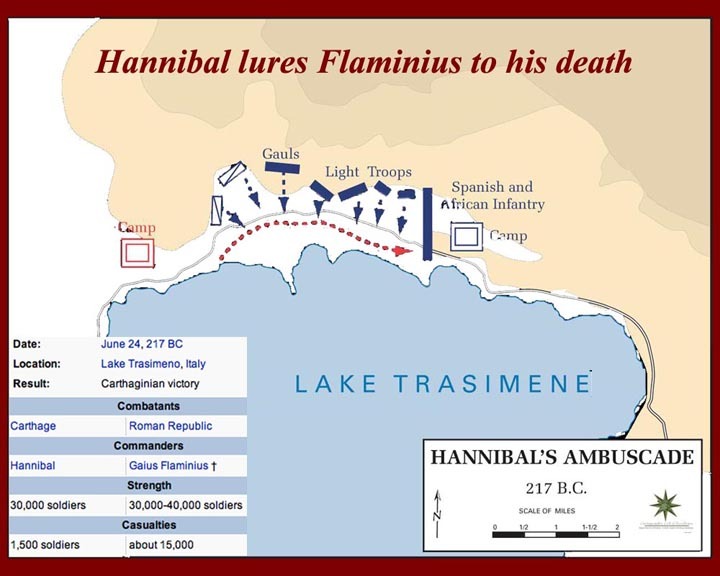 Hannibal let him catch up on the northern shore of Lake Trasimene. 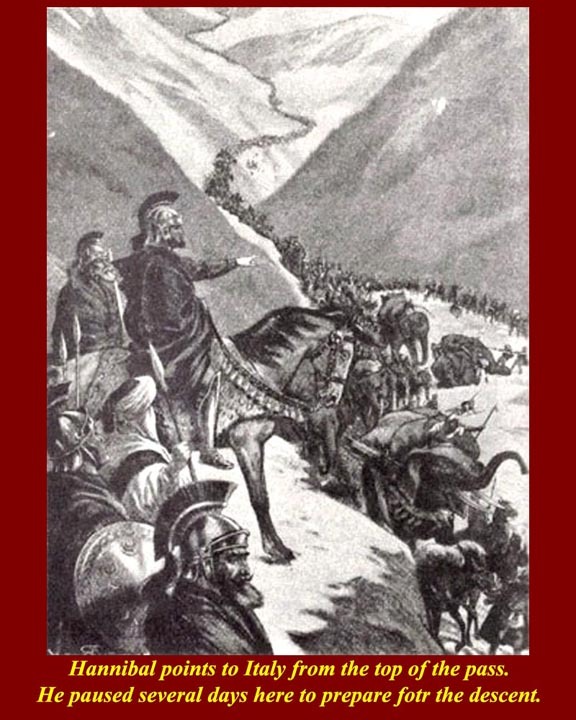 Flaminius was caught between the lake shore and Hannibal's troops hidden in the hills north of the lake. 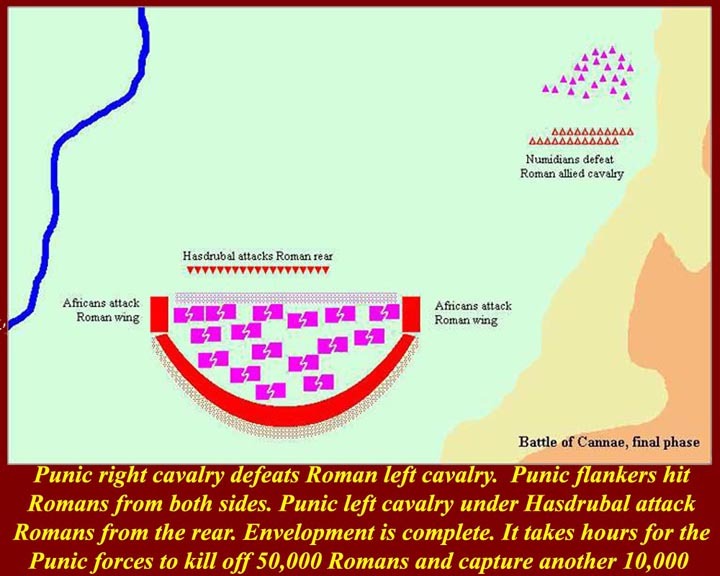 According to Polybius, Flaminius and many of his men were killed by Punic cavalry as they tried to swim to safety. Meanwhile, near the mouth of the Ebro River in Spain, a Roman fleet destroyed the Barcid Spanish fleet. The worst blow to Roman morale, however, was at Cannae near the east coast of Italy. 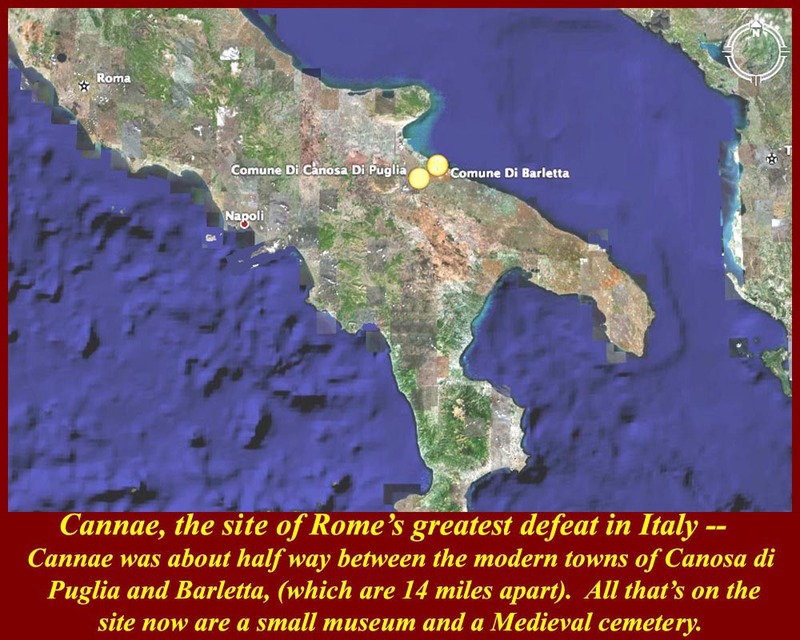 Battlefield maps that show Hannibal's August 217 defeat of Rome's two Consular armies for that year. 50 to 60,000 Romans were killed in the battle: it took hours to slaughter them after they were enveloped by Hannibal's army. A late 17th century statue of Hannibal counting the gold rings of Roman equestrians after the Cannae battle. The Cannae battlefield from the air. Hannibal even menaced Rome in an attempt to provoke a big battle, but the Romans refused to take the bait. 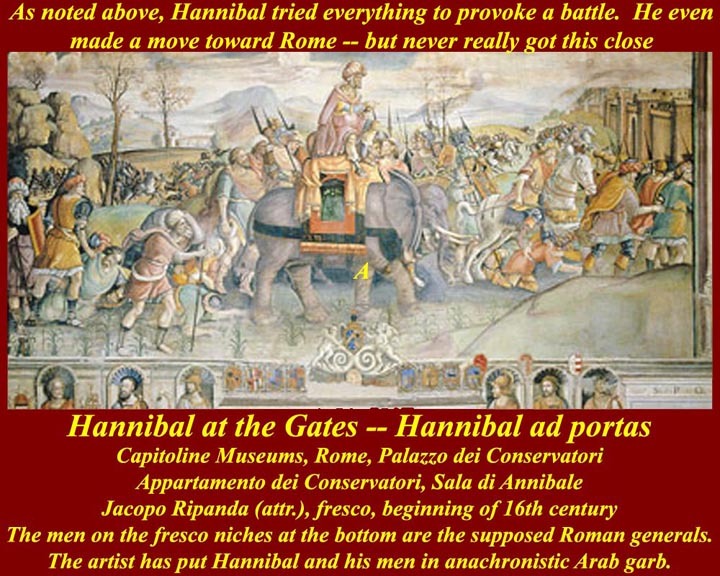 Hannibal (who never got as close as the image shows to the walls of Rome) backed off: he knew he could not besiege the city. Hannibal had no source of supplies other than foraging, and, if he sat in one place for too long -- outside the walls of Rome, for example -- his army would be starving before the city would. By 208 BC both of the Scipio brothers in Spain were dead, and that young Scipio warrior, who had legendarily saved his father at Ticinus, had been elected leader by the Roman army in Spain and ratified by the Senate in Rome. He had briliant victories, but Hasdrubal still managed to slip out of his grasp and take another Barcid army across the Alps into Italy. Once Hasdrubal was out of Spain, Scipio (later Africanus) mopped up all remaining Carthaginian forces in Spain. Hasdrubal was quickly intercepted at the Metaurus River by Marcus Livius Salinator, but Hasdrubal had the numerical advantage. During the night before the battle, the situation dramatically changed when Gaius Claudius Nero arrived with more light infantry and cavalry to reinforce Salinator. 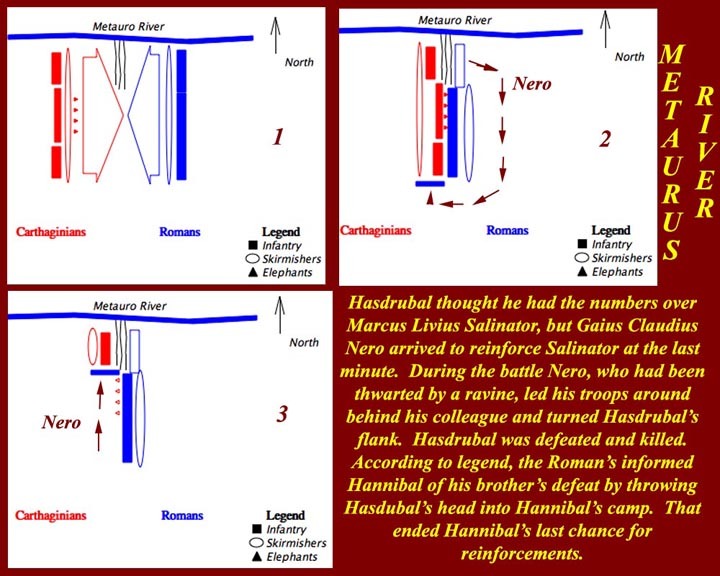 During the battle, Nero, who had come up against a natural barrier, took the bulk of his troops across Salinator's rear and rolled up Hasdrubal's opposite flank. Hasdrubal was killed, and his head was thrown into Hannibal's camp to announce the Roman victory to the Carthaginian forces. 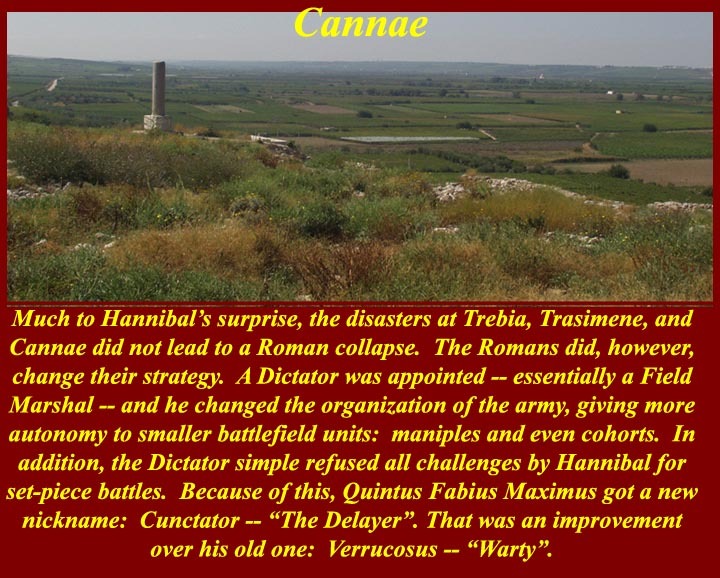 Hannibal then knew that there would be no reinforcements, and he lapsed into the same kind of guerilla rear action that his father, Hamilcar, had run in Sicily during the first Punic war. Young Scipio, meanwhile, began to aggitate for an invasion of the Carthaginian homeland in North Africa. 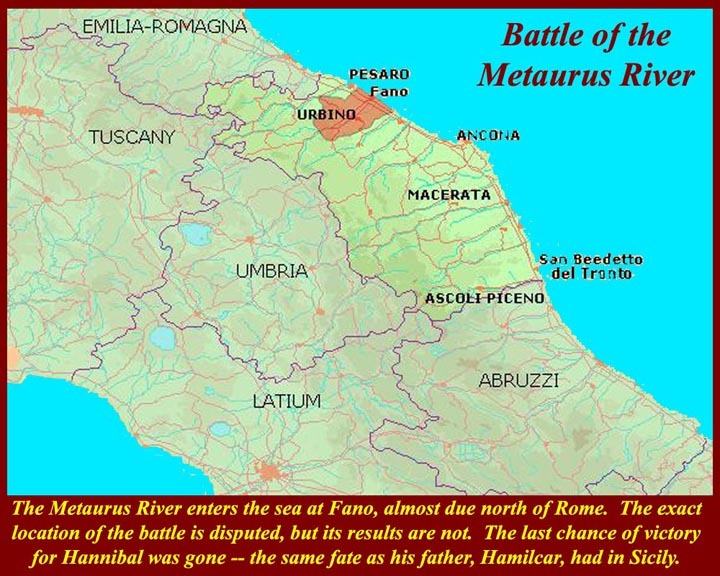 The Metaurus River battle was the last set-piece battle in Italy, and Hannibal did not participate. In 203, the reluctant Roman Senate sent Scipio to Sicily knowing full well that he planned to launch a North African expedition, but they stipulated that he could only take volunteers. They probably thought there would not be many. But Scipio's record as a successful general was such that his rolls were soon oversubscribed. The survivors of Cannae, who had been sent to Sicily in disgrace, were particularly anxious to participate. 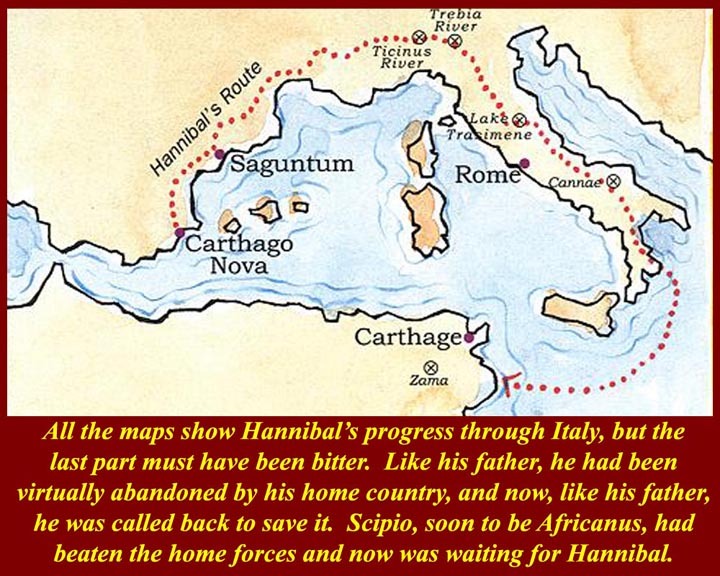 Scipio's North African campaign was so successful that Carthage soon recalled Hannibal to face him. 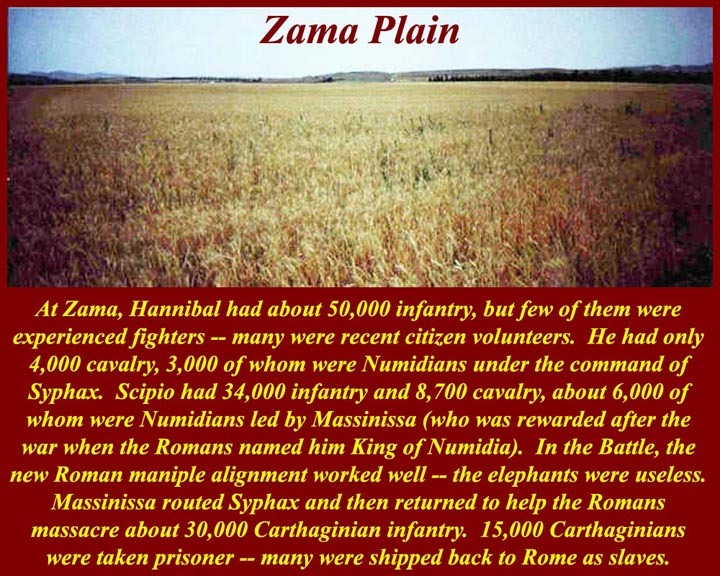 Hannibal would finally get his battle at Zama. 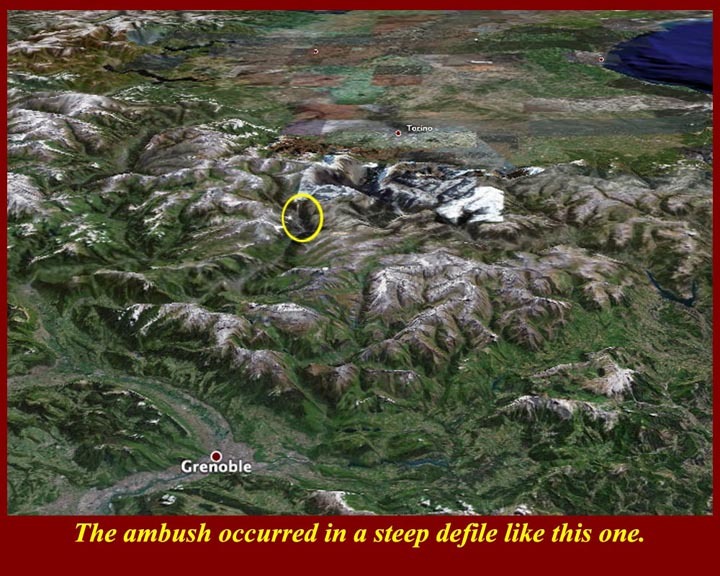 A satellite view of the battle area. At Zama, roles were reversed. 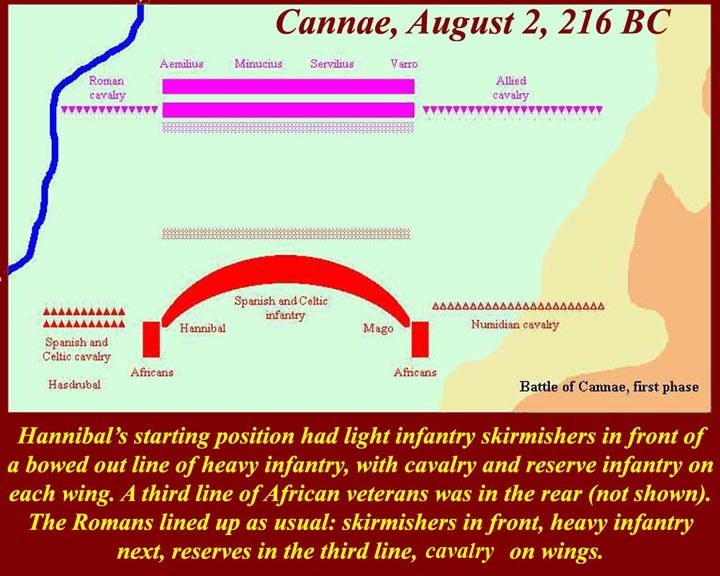 Hannibal, for the first time, had an advantage in infantry numbers, but they were inexperienced. Scipio had fewer infantry, but they were veterans of his Spanish victories and from the Sicilian garrison. 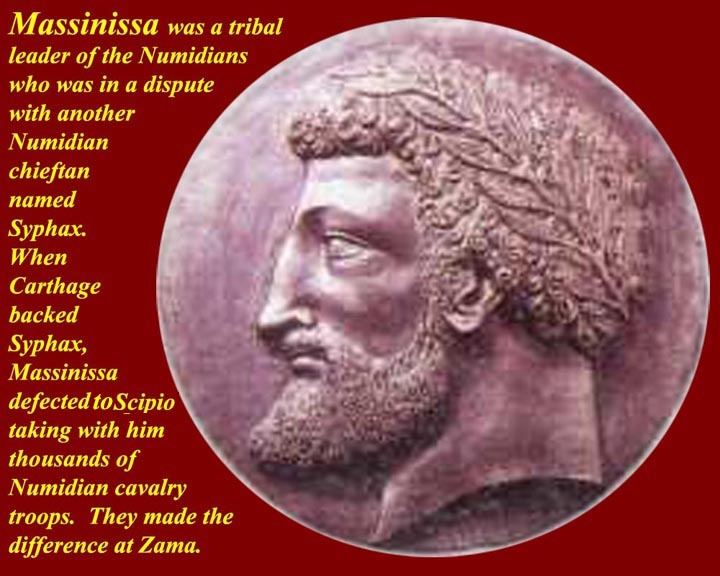 Hannibal's great and unaccustomed deficit was in cavalry: six thousand Numidian cavalrymen under Masinissa, who might otherwise be at his side, were riding on the right flank of Scipio's army and fighting against Hannibal. 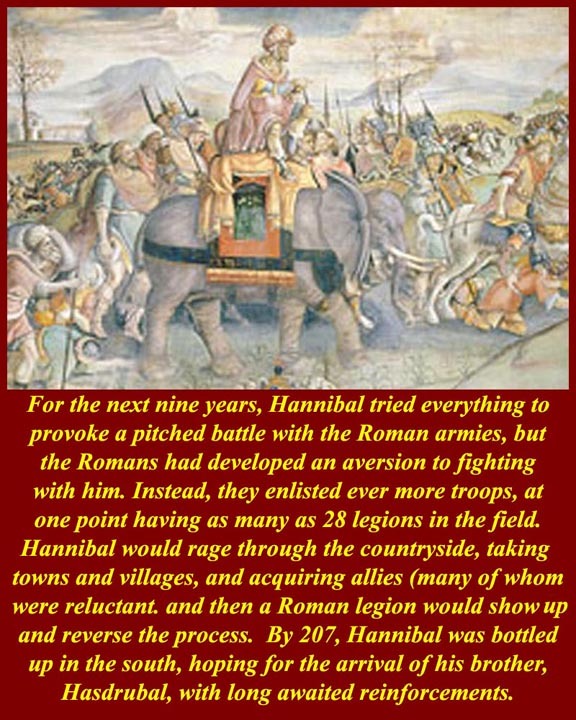 Rome had also, by this time, figured out how to neutralize Hanibal's elephants. An animation of the battle is on the internet at http://www.sharemation.com/piermin/Romani/Zama_en.html. 30,000 Carthaginian troops were killed at Zama and another 15,000 were captured, many of whom were shipped back to Rome as slaves. 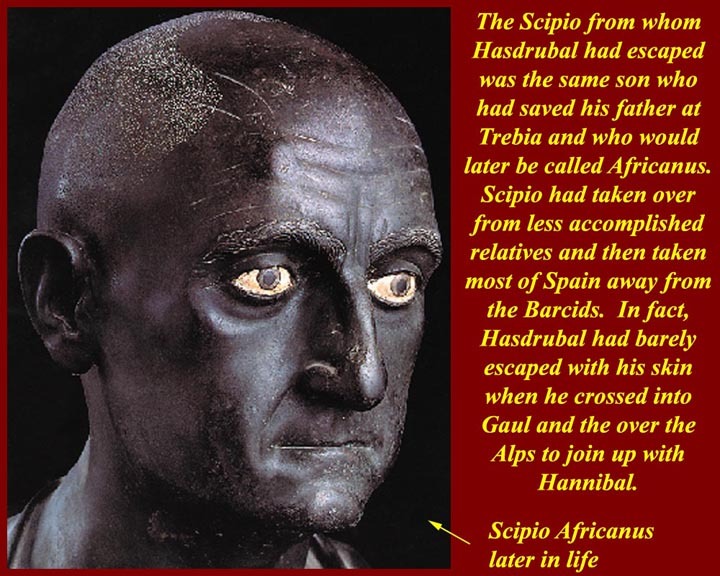 Hannibal survived the battle, and Scipio allowed him to be active in politics in Roman-occupied Carthage. 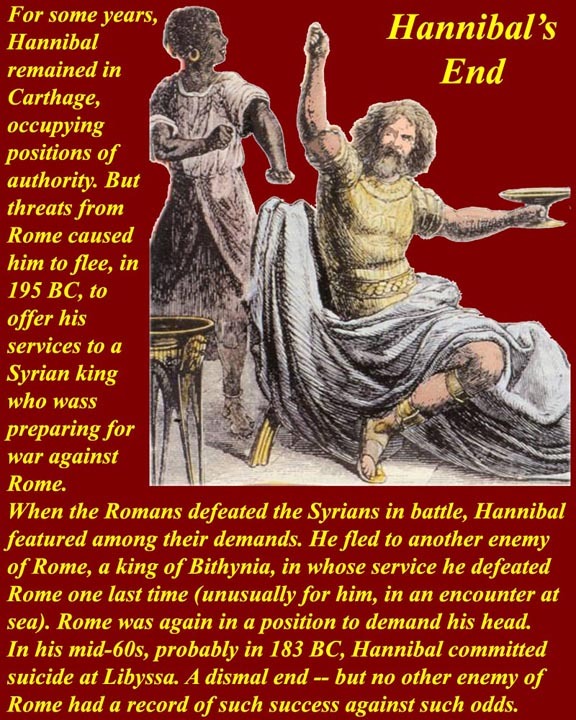 But public opinion back in Rome objected to this leniency, and Hannibal eventually fled to the eastern Mediterranean where he found employ in a Syrian war against Rome. When the Syrians lost their war, he fled again to Bythnia. Between Syria and Bythnia, he fought against Rome for another 20 years -- his last battle was a naval victory over a Roman fleet. When Bythnia succumbed to Roman might, the Romans demanded that he be sent to Rome. 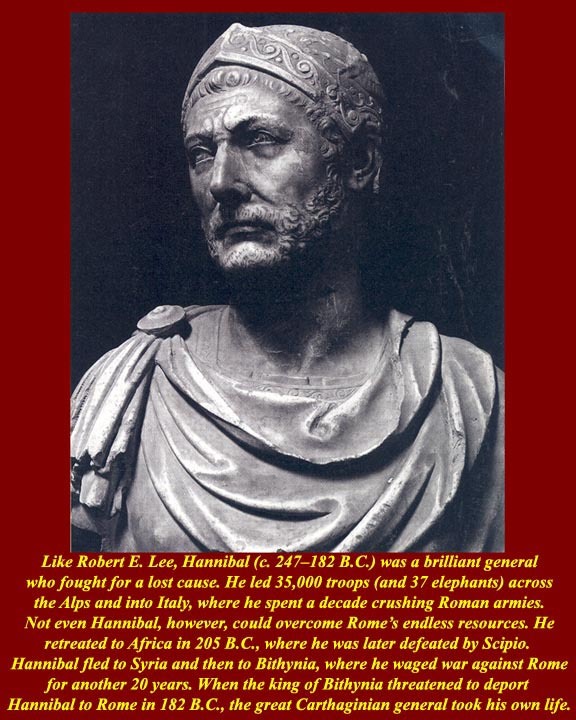 To avoid capture Hannibal committed suicide in 183 BC. 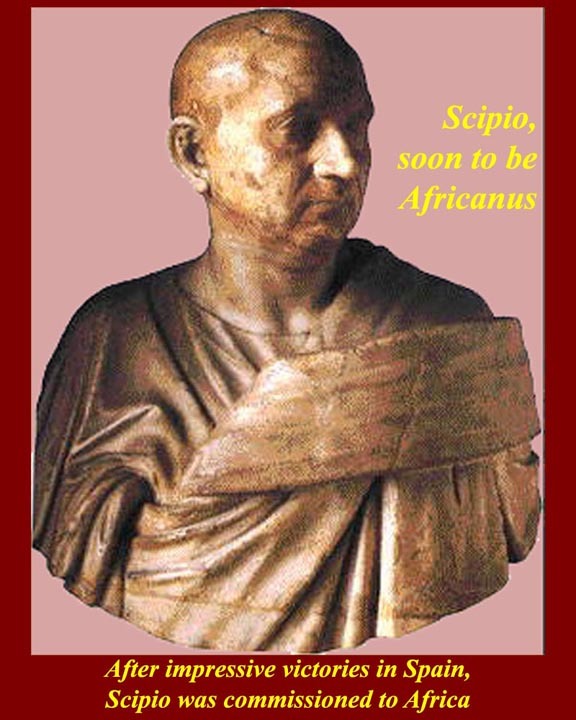 Scipio was awarded a formal triumph in Rome and became the first Roman to be awarded an agnomen, Africanus, related to a victory. He later got another agnomen, Numantius, for his pacification of a revolt in Roman Spain. Eventually, he was brought low by Roman politics -- Cato the Elder accused him and his family of bribery. 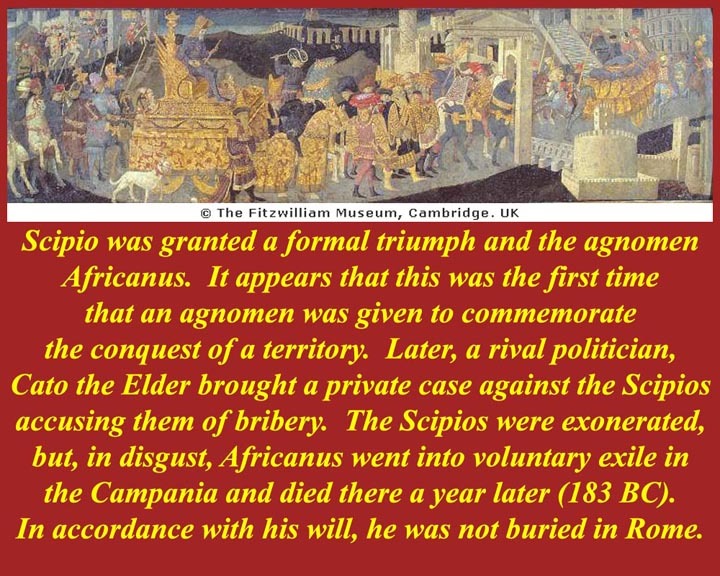 Scipio won the case, but left Rome in disgust. He died at his Campanian estate the next year (183 BC) and had stipulated that his body should not be buried in Rome.